Red Sun Stone Show, we are natural stones distributor and installation constructor; slate, sandstone, mountain stone… with our long experience professional team that will make the best quality modern and beautiful design. Red Sun Stone Show is a leader of decorative stone service, we offers superior quality natural stone wall cladding for residential, commercial, interior and exterior landscaping. At here, you can find the perfect wall claddings that make your project unique and attractive. You can choose natural stone materials which one you like; sandstone, slate, dam edge stone… we have experience specialists are always on – hand to provide all type hardscapes; fence decoration, car park, road, swimming pool, dam edge stone line up and others. In addition, Red Sun Stone Show had a great honour from the Fine Arts Department to be published all our renowned masterpieces in the book “Historic Site”, which belongs Archaeological office, Fine Arts Department, the ministry of Culture. 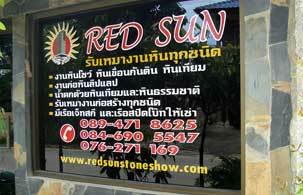 Therefore, Red Sun Stone will keep our reputation the best as the purpose of the Fine Arts Department.